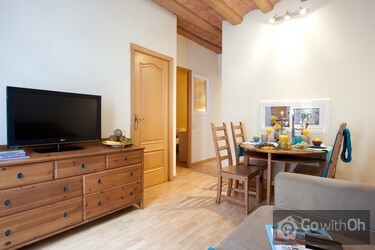 This is one of our best located Barcelona vacation rentals. You can reach the main tourist sights within a few minutes walk. This modern and well-decorated vacation apartment of 50 sqm boasts traditional Catalan vaulted ceilings, parquet floors, solid wood furniture, a well-equipped kitchen and a bathroom. It is ideally suited for couples or a family, as it has two bedrooms with double beds. Both the living room and the master bedroom have small balconies. The second bedroom is interior but with a window looking onto the hall. There is free Wi-Fi. Casa Roser is perfectly located on a side street next to El Molino Theatre. 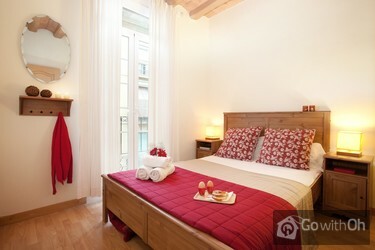 La Rambla, the Gothic quarter, ports and shoreline are all within easy walking distance. The Paral.lel metro and funicular are just a few metres away, giving direct access to La Pedrera, Sagrada Familia, Park Guell and the Montjuic National Park as well as the shopping districts of Passeig de Gracia and Diagonal. There are good connections to the airports and buses to Barceloneta and the beach. You can find plenty of bars and cafes in the local streets. From 22:00h, Extra charge of 30. Check in on 24th, 25th, 26th, 31st December and 1st January, Extra charge of 30. Should you not have left the apartment before 11h you will be asked to leave immediately and you will be charged a surcharge of 50. Very good location both with public transportation and for walking. Side street but noisy if balcony door open. This time of year not very hot so flat agreeable but afraid in summer very varm. Extremely flexible and welcoming english speaking contact person and landlord. Quizá convenga advertir de la estrechez de las escalesras y lo empinadas que resultan. Por lo demás, tanto el equipamiento del apartamento, como su limpieza, me parecieron muy satisfactorios. The appartment was lovely. Everything was there that we needed and it took about 15 minutes walk to get to Las Ramblas, which was great. We would definitely stay there again! nice. pretty much what we thought. access to the rooftop terrace was superb, as were the balconys. I think the flat needed those 2 external spaces however as it's quite small. we felt the inside bedroom was harsh. ceiling fans in the lounge and definately in the inside bedroom would be a very ...very very good idea, as would an air vent in the inside bedroom! my friend and I slept in the inside room and we have to admit, we actually found it far more comfortable sleeping on the rooftop terrace! could also do with some more kitchen utensils, we cooked alot in the flat and found it quite tricky due to the lack of knives, plates and cooking stuff in general. small gripes though, we didnt go to barcelona to complain about cutlery, we had a lovelly stay! Modern and spotlessly clean. Double glazing cuts out any sounds from street (if weather permits!). No furniture on roof terrace so not really a benefit to the accomnodation. Street not especially pretty but quiet at night and you can be at Parallel tube station in less than 5 minutes walk. Also supermarket in street very handy for groceries. The accomodation was as decribed and pictured on the website, actually it was better. Clean, comfortable, absolutely great! 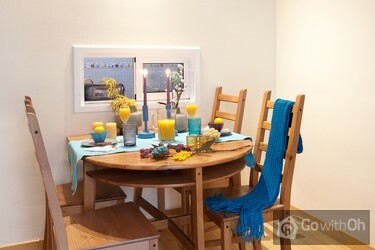 This was a tastefully decorated, small apartment and was accessible to main attractions but felt amongst locals. The beds were comfortable, however we couldn't get the sofa bed to fit when folded out. Just a few recommendations - new towels would improve the apartment,the shower holder needs fixing & bath drain needs attention. Appartement très bien situé, à deux pas du métro, calme et finalement pas si loin de la vieille ville. Un bémol: escaliers très escarpés, évitez les valises lourdes. Nous avons eu une mésaventure: la personne de contact, par ailleurs très sympathique, n'est pas venue à l'heure nous ...restituer la garantie et n'était pas atteignable par téléphone. Fort heureusement le propriétaire a très rapidement contrôlé la chose et nous a remboursé sans problème. Nous sommes allés en automne et on ne nous a pas montré la terrasse, mentionnée sur le site. Posizione della casa ottima, a 2 passi da metro, bus e a 10 min a piedi dal centro. Peccato che non ci sia l\'ascensore, ma se siete giovani e con bagagli non pesantissimi non ci sono problemi!!!! 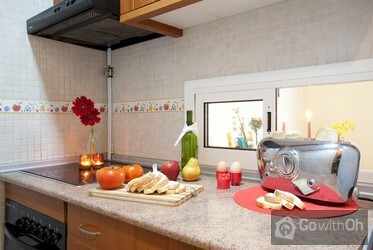 Total nettes Apartment, Stiegen etwas anstrengend zum steigen *g* und sehr nette Vermieter!!!! Good location in Barcelona. 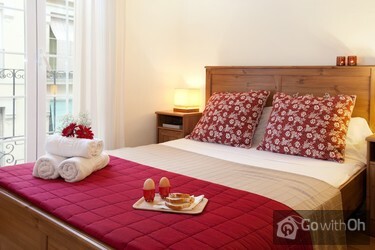 Close to metro station, Las Ramblas and sea. But the apartment was full of bugs and insects. Needs to be cleaned of bugs and insects. difficult to climb the narrow, steep stairs. Specially with luggage. Absolutely not for kids. L'appartement est très bien situé! Quelques reproches sur le ménage à notre arrivée et les draps qui n'étaient pas propres. 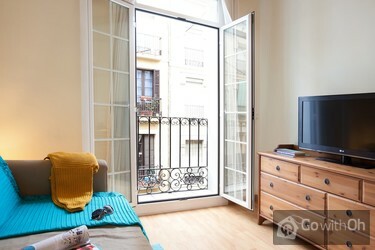 The appartment is placed good between the rambla end Montjuic. near metro, buses end habor. The desription of the apartments is correct, end what we expected. The noise level was very low.We were satisfied with the apartment. I would recommend a more balanced lighting outfit to enhance more cosiness. This may be a typical dutch habit, but nevertheless. A warning sign in the stairhouse telling about some unequal steps and a tricky triangle step may increase personal safety. i was very satisfied with the accommodation. You really need to get rid of the cockroaches. Emphasize the stairs leading up to the apartment, very narrow and steep,apartment located on the 3rd or 4th floor. My mistake for not noticing NO TV on the website. A great reasonably priced if cosey flat in a location which despite being off the beaten track is only 10 mins from La Ramblas. très bon accueil, appartement bien placé, que dire d'autre? 8/10 escaliers un peu dangereux mais sans plus... très chouette appartement pas loin de la Rambla mais assez pour être relativement au calme. La luce sulle scale (al 3° piano) non funzionano,una lampadina all'entrata non funziona la luce della cappa nella cucina non funziona,un fornello non funziona,in sala ci sono 3 faretti in alto sopra il tavolo,una pende a testa in giu e una lampadina manca,alcune prese della corrente sono finte il ...cesso si intasa a volte ci sono degli scarafaggi......1600 euro in 3 2 settimane...mi sembra esageratissimo. El acceso al piso deja mucho que desear no se muestra en absoluto lo que realmente es, el dueño llegó tarde el primer día y el último más de media hora retrasándonos nuestro viaje de regreso,el primer día no nos cobro los 20 de recargo por llegar despues de las 11 de la noche ya que el que ...llegó tarde fue él, pero el último día nos lo reclamó y solo nos devolvió una parte de fianza quedándose con el resto me parece una falta de seriedad muy grande primero no nos lo cobra y el último dia coje el dinero de la fianza. Apartment was much smaller than web description suggested - it was ok for a couple but not for a family or two couples. The steep climb up 3 winding flights of stairs should be highlighted in the advert, it\'s a big ask with luggage. Bed needs replacing, it\'s really just a box that slopes towards ...the middle. Drainage in toilet and bath is poor. TV or radio would be good. On the plus side, it was clean, well located, and J. (contact person) was helpful and prompt. NOTE FROM OH(24th DEC 09): the owner inform us that the pump in the bathroom has been replaced and the bed has been fixed dated 24th of December. Wohnung sehr zentral und gut gelegen.Nachts gelegentlich laut. Austausch einer Matratze überfällig. Das andere Bett o.k. Appartement convenable cependant il n'y avait pas internet contrairement à ce qui était indiqué. Matratze im kleinen Zimmer muss dringend ausgewechselt werden, da stark sie durchgelegen ist und beim Schlafen Schmerzen verursacht. Insgesamt haben wir uns sehr wohl gefühlt. On a eu l'occasion de réserver le jour même. Tout s'est très bien passé. We had a nice stay. The bed was very comfortable and street noise was minimal so we slept well. 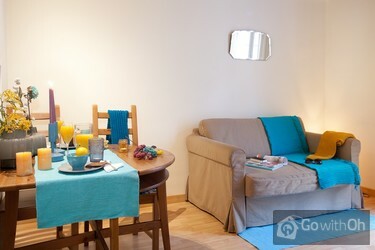 The apartment is very close to the Metro and not too far a walk to the center. It was easy to coordinate with our contact person. Stairs are somewhat steep- that's the only complaint. The apartment was an excellent apartment for a short break with two couples. The stairs are a bit steep, and the toilet/shower makes a strange noise, but everything worked fine and there were no problems. The second bedroom was a little stuffy with the door closed, but once open it was fine. The ...surrounding neighbourhood had great places to eat and good transportation links. Highly recommended. The apartment requires a better room fan to allow for air flow once the windows are closed. Je donnerais la note la plus basse, la personne s'est présentée avec 1h30 de retard pour notre départ alors que nous devions nous rendre dans une autre ville. Elle nous avait "oubliée" et ne s'est pas excusée. C'est lamentable! Le propriétaire confirme qu'il s'agissait d'un cas exceptionnel dû à un incident imprévu. Pour toute information, demande, incident durant votre séjour, le Service Client de Oh-Barcelona est également disponible tous les jours entre 11h et 20h. abbiamo trovato casa sporca al nostro arrivo. servizio perfetto e efficente al massimo. Appartamento più piccolo rispetto a quanto si veda dalle foto. 4 persone ci stanno strette. Noi eravamo in 2 e non abbiamo avuto problemi. Posizione comoda vicino alla metropolitana. Cose che non ci sono piaciute: RUMORE di notte, persone che urlano fino al mattino. Tre piani di scale strettissime. Zona non proprio sicurissima. ne demeure pas sur place. difficile à rejoindre pour problèmes. ne vaut pas le prix demandé. Grille-pain défectueux. Lit dans la petite chambre très inconfortable,on sent tous les ressorts. Tres bruyant soir et nuit.Si on ferme les fenetres,c'est tres chaud. Clés pour entrer ne fonctionne pas ...bien,très difficile d'ouvrir la porte surtout que lumières dans le corridor sont brûlées. Le propriétaire confirme avoir pris toutes les mesures nécessaires pour assurer le bon état de l'appartement et régler les disfonctionnements. Was exactly as it stated on the website and as shown in the photos. The apartment is quite little but was perfect for two friends sharing and the location couldn't have been better with a metro station about 100metres away and a supermarket opposite. Everything we needed was in the apartment and A. ...was lovely and very helpful. The only note for others is that the apartment is on the third floor with no lift and the stairs are fairly steep and narrow which might be an issue for those that find walking a little harder. Bon contact mais en retard à la remise comme à la restitution des clés. À noter que l'appartement est bien, mais que les photos le mette particulièrement en valeur. L'une des deux chambres n'a pas de fenêtre. La salle de bain n'a qu'une minuscule fenêtre qui donne sur le couloir. La pompe des... wc est très bruyante et fonctionne des que l'on utilise l'eau dans l'appartement. Sinon bon emplacement proche du centre ville. Steile Treppen, nichts für Senioren. Gelegentlich leichter Müffelfaktor vom Abwasserrohr. Ansonsten gut. appartamento trovato sporco all'arrivo. ma per il resto tutto perfetto! è in un ottima posizione, molto consigliato per l'assenza totale di rumori esterni! Die Wohnung war früher sicher mal ein Schmuckstück. Jetzt aber weißt sie deutliche Abnutzungsspuren auf und die Sauberkeit besonders in Küche und Bad ist sehr mangelhaft, ja eigentlich eklig. Die Küchengeräte, Töpfe und Pfannen sind nahezu nicht zu verwenden. Eigenes Kochen macht in dieser ...Küche keinen Spaß. Für das Gebotene ist die Wohung daher auch zu teuer! Der Eigentümer bestätigt, die Ausstattung der Wohnung erneuert zu haben und darauf zu achten, dass die Wohnung immer sauber an die Gäste übergeben wird, damit diese dort einen unbeschwerten Aufenthalt verbringen können. // The owner confirms that the apartments equipment has been upgraded and guarantees that the guests will always find the apartment clean and tidy so that they can enjoy a pleasant stay. 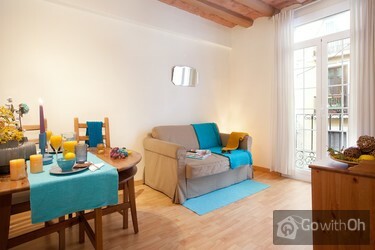 Really nice apartment in the centre of Barcelona. It looks just like in the pictures, bright and very clean. We were aware of the steep stairs from reading the past comments so it wasn't such a problem. The kettle didn't work and the mattress in the small room definitely needs changing as it was ...quite uncomfortable.. apart from this, we were very happy with the apartment. Good communication with the person who gave us keys, deposit returned without any problems. Thank you! We had an amazing time in Barcelona - but the accommodation had a few flaws: Upon arrival the flat wasn't well cleaned, it was dusty, hair from the previous guests in the drain etc., the water kettle and 2 light bulbs was broken. The contact person didn't speak well english leaving us a bit ...confused. Upon departure: asked if we could meet at the flat at 14.30 which contact person pushed back to 12.00 and then arrived 35 mins late leaving us having to change our plans. The contact person who picked up the keys was also instructed to charge us an additionel 35 pr person for cleaning which we were never told in advance - but he ended up not charging us as he could see we were not told in advance. It was all smaller things however and I would use the Oh Barcelona website again. There was a lot of mold in the bathroom! Oh-Barcelona.com thank you for your comments. We have now reviewed the apartment with the owner, who has confirmed that they have taken appropriate steps to ensure a thorough cleaning of the apartment. Appartamento veramente sporco al nostro arrivo, il tubo doccia era rotto ed abbiamo provveduto a sostituirlo noi comprando tubo e cipolla al cinese sotto la strada. La posizione è buona a pochi passi dalla metro ed abbastanza centrale. Andrebbe segnalato che è al terzo pianoi ma le scale sono ...stratte ed alte, faticoso per chi viaggia con tanti bagagli o con figli piccoli. Il contatto è stato gentile, ed è sembrato veramente mortificato per le cose che non andavano. Il proprietario conferma prendere nota dei disagi e garantisce un miglior seguimento dell'alloggio al fine di proporre un soggiorno quanto più confortevole possibile. Tenga presente che per qualsiasi problema che possa sorgere durante il soggiorno, il Servizio Clienti e il proprietario stesso sono a disposizione dei clienti. The apartment looks as it does in the photos, maybe a little smaller. It has a nice quaint sort of a feel to it. My wife and I had a great time here. Location is perfect. 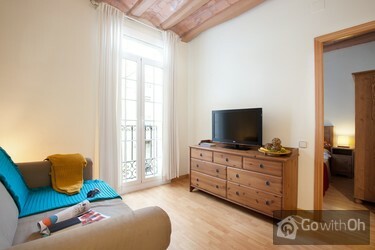 10 min walk to the port or la Ramblas. 2 mins from la parelel metro stop. Market out front. Contact info was great. Read your ...email from D. before you go as contact info on site might differ :)....The apartment is an average size, main bed was good. Might have a bit of an issue with hot water if you had a full house??? All appliances needed are there. 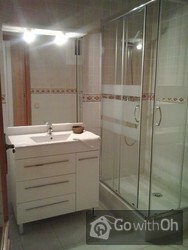 Bathroom needed a bit of bleach...but we also were a little early...No problems with deposit. Watch the stairs! A. did help us with the bags which was nice... Would reccommend. Thanks. Die Ferienwohnung bedarf einiger Renovierungen. Um den Aufenthalt für zukünftige Gäste zu verbessern, sollten Sie über einige Neuanschaffungen nachdenken. Damit meine ich beispielsweise das Bett (in welchem man jede Feder im Rücken spürt), eine Renovierung des Bads (es ist alt, ...heruntergekommen, es schimmelt). Überdies ist das Glas der Haupteingangstür gebrochen, sodass jeder Fremde ohne Probleme Zugang zum Haus hat. Ich würde die Ferienwohnung aus diesem Grund für eine Gruppe, die nur aus Frauen besteht, nicht weiterempfehlen. Sehr geehrter Kunde, Vielen herzlichen Dank für Ihr Feedback. Wir bestätigen Ihnen, dass die Wohnung renoviert wurde: das Bad wurde renoviert und die Fliesen erneuert und alle Wände der Wohnung wurden neu gestrichen. Zudem bestätigt der Eigentümer der Wohnung, dass auch das Bett so schnell wie möglich durch ein neues Bett ersetzt wird. // Dear client, thank you for your comment. We can confirm that since your stay the apartment has been refurbished. 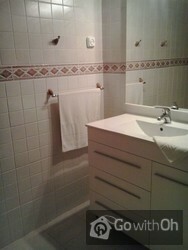 The bathroom and the tiles have been refurbished and the entire apartment has been painted. The owner has also confirmed that the bed will be replaced with a new one as soon as possible. The apartment was quite worn out. The toilet seat was loose and many mouldings were broken. Th door lOck was tricky and main entrance door remained broken two weeks. In the hallway the bulbs were broken, the stairs very narrow and high and electricity was out several hours. Zu bemängeln war auf jeden Fall die Küchensituation, das Geschirr und Besteck war offenbar lange Zeit weder benutzt noch gereinigt worden, es stank aus den Schränken. Das dritte Zimmer war wirklich nur eine Abstellkammer ohne Fenster. In den Schränken konnte man kaum etwas unterbringen, zumal ...ein Schrank abgeschlossen war und der andere mit Bettzeug vollgestopft. Das Bad mit der Wasserpumpe konnte man als urig bezeichnen, aber ein paar Haken, wenigstens eine Duschmatte oder ein Handtuch für den Boden hätten es etwas aufgewertet. In der Dusche ist man durch die megarutschige Duschmatte immer Gefahr gelaufen, hinzufallen. Apartment is well-located and provides basic accommodation. Another fan is needed as it gets very hot and two are insufficient. The fridge badly needs defrosting. Some of the kitchen and living room drawers are now damaged and falling apart so these need replacing/mending. And the showermat/bathmat was filthy when we arrived and wasn't changed at all. Wie bereits in anderen Kommentaren erwähnt, ist die Wohnung in einem mehr als renovierungsbedürftigen Zustand. Das Badezimmer hat viele verschimmelte Ecken, eine Grundreinigung wäre wirklich nötig. Wer ein Woche bleibt, bekommt nur ein Badetuch u. ein Handtuch. Die Küchenschränke sind voller... Ramsch und ungeputzt! Der Gasherd mag ja sauber sein, aber was bringt das, wenn es keine Gasleitung gibt. Kein Platz für Kleidung im einzigen Schrank! Schmutzige Kommodenladen! Das Treppenhaus ist unheimlich eng und steil. Mit einem Koffer in den 3. Stock hinauf und später runter ist ein riskantes Unternehmen, auch für junge Leute. Lage: Sehr sehr laut, die ganze Nacht über. Der Urlaub ist eine Erholung! Kaution: Eine persönl. + gemeinsame Kontrolle mit Feedback am Urlaubsende ist wünschenswert! Wir waren sehr zufrieden mit dem Apartment, nur das Parkieren ist recht schwierig dort. Aber am Ende hat es doch geklappt. Die Wohnung war recht kalt Ende Dezember, der Heizlüfter hat kaum gewärmt, aber es hat uns trotzdem dort sehr gut gefallen. Appartement très bien placé proche du métro Parra-lel dans une petite rue tranquille idéal pour dormir la nuit. Appartement propre sauf le matelas de la chambre qui présentait de grosses tâches (il n'y avait pas de protège-matelas). L'appartement est bien équipé. Il est situé au 2ème ...étage sans ascenseur et l'escalier est très étroit avec des marches de hauteur inégale. 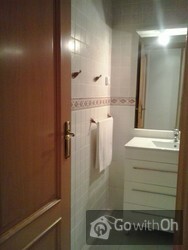 Apartment was very nice and clean, in very good location with very good local amenities, e.g. a few shops on the street, lots of cafes and bars around, very close to buses and metro stops. 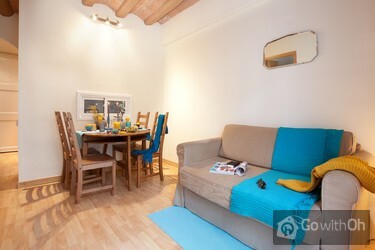 Also within 15 min walk to Columbus monument and La Rambla. I would not hesitate to stay here again for short stay. Die Wohnung liegt in einer Strasse mit Geschäften, die tagsüber offen haben, Restaurants und Bars sind in der parallelen Strasse, somit in der Nacht ohne Trubel. Alles sauber, frische Handtücher, kleines und funktionierendes Apartment. 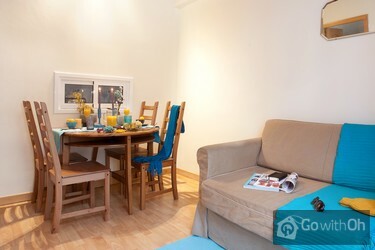 Quaint apartment in a nice neighborhood away for the main tourist hotels, yet very convenient to public transportation and many of the main attractions of Barcelona. Nice selection of places to eat along with food/fruit stands made this a good choice during our time staying there. Die Lage des App. war gut. Die Treppe im 3. Stock ist sehr eng und steil. Der Vermieter hat wohl ein Problem mit dem Eigentümer unter ihm, der einen Wasserschaden durch die Toilette, die nicht fest montiert ist und wohl vorher mal ausgelaufen ist. Der Eigentümer hat sich auf seine Handy-Nr. nicht... zurückgemeldet und hat uns auch nicht gesagt, dass ein anderer uns die Wohnung übergibt. Sehr geehrter Kunde, wir danken Ihnen für Ihre Hinweise, die wir gerne berücksichtigen werden. Der Vermieter bestätigt, die Mängel im Badezimmer behoben zu haben. The location has to be the best in barcelona for all the sights, jut a few steps from the underground and a short walk to the Rambler, harbour and main shopping area. The apartment very quaint and cosy. Die Lage der Wohnung war super und die Unterkunft an sich in Ordnung. Allerdings sind die Treppen, die zur Wohnung führen, sehr schmal und in der Wohnung roch es nach Keller. Apartment was perfect, great location and very lovely manager. We really enjoyed our stay here and would recommend it to other guests. Apartment was ok - just as advertised. Just some annoying tidbits: - one of 2 provided keys does not work and the one that works requires some wrestling to open the door:/ - kitchen could be equipped better. I mean it's like EUR 2 per stay for an owner to provide basics like sugar, salt, cooking ...oil, some detergent for washing machine, but it makes your stay more enjoyable and if you forgot some of these, you have to buy a whole package. Dear customer, we appreciate and value your feedback. The owner regrets the inconvenience you experienced with the key, and confirms that he tells the clients how to open and close the door at the time of check-in. The location near the harbour and Montjuice is great. The neighbourhood is colourful and calm. We didn´t like the stairs to the appartement, the flush and sometimes the tang coming from a ventilation grid. Dear Customer, We thank you for your comments. The owner confirms having reviewed the toilet, and confirms that it works properly. Appartement très bien situé, propre. Le fait d'avoir les 2 chambres séparées du salon est très appréciable.Les escaliers sont un peu rudes, la chasse d'eau fait beaucoup de bruit et il manque une vmc dans la salle d'eau. There is everything in the area you could wish for. The apartment itself is small and nice, well equipped and clean. Our kids loved the stairs! If you like to do sports, Montjuic part is 2 minutes away and offers great running opportunities. Absolutely worth to stay there. Dear client, thank you for your feedback. We remind you that on the website it is indicated that this building has no elevator. We would also remind you that the welcome pack contains a minimum of toilet paper, washing machine powder, dishwasher soap etc. but in no case any food products. Cher client, nous vous remercions beaucoup pour vos commentaires. Le propriétaire confirme avoir remplacé le ventilateur avec un nouveau et avoir décongelé le frigidaire. De plus, il nous informe quil y a en effet suffisamment de vaisselle en fonction de la capacité maximale de lappartement. From the moment we arrived, the host was terrible. We had to wait 2 hours at the airport because the check-in time was strict, we didn't have this issue with the 11 A we stayed at during our 6 month trip in Europe. When we called the host, she said she would be there in 5 minutes. After 15 minutes I... called her back to see if we were at the wrong place and she answered the phone with a rude "What? You can't wait?". When she arrived and we asked why she was so rude to us on the phone, she said "Do you want me to let you in or not?" We had been waiting in 35 degree heat with our 2 year old daughter for 25 minutes for her, unacceptable. The apartment was dirty, there were cockroaches in the stairwells and the bathroom smelled like sewage and was infested with silverfish. Aweful! Dear customer, thank you for your feedback. We regret to read that your stay in the apartment was not satisfactory and confirm that we have passed on your comments to the owner in order to guarantee a high quality of the service offered. The owner confirms that he has reviewed the bathroom. Please remember that the check-in normally starts at 4pm, as indicated on the website. If possible, the owner of course always tries to adapt to the arrival times of his guests if they arrive early in the morning in Barcelona, but this always depends on the availability of the apartment as there might be other clients leaving the same day. Unfortunately, in this case it was not possible to do the check-in before 4pm. In any case, the agency always provides the possibility to store the luggage between 9am and 8pm during the week and from 11am to 8pm on weekends and bank holidays. Also our Customer Service department is available every day of the year from 11am to 8pm. Es war alles wunderbar, wie erwartet! Very nice appartment, easy access to metro. G C was very helpfull in giving us tips and places to go in Barcelona. 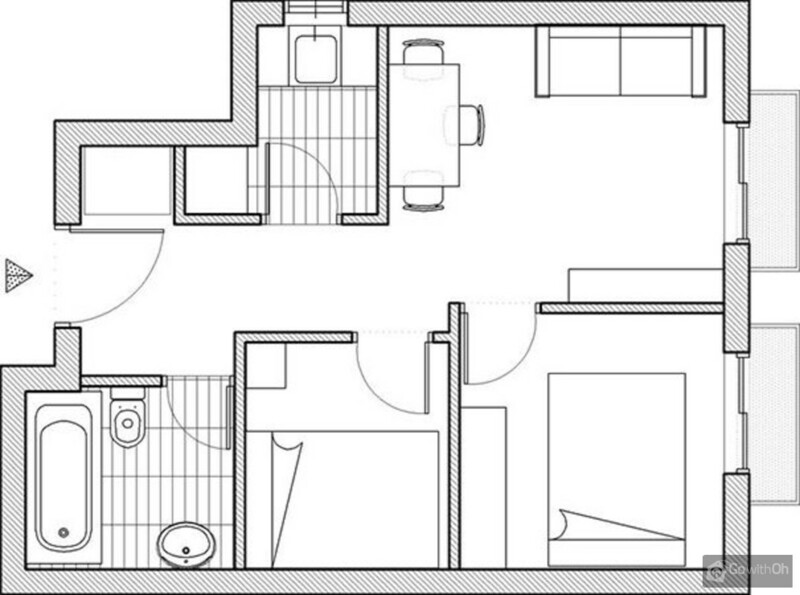 Un appartement de petite taille et un peu sombre mais très calme, avec des fenêtres avec double vitrage et une salle de bains toute rénovée. De plus il est très bien situé, au pied de Montjuic et à 10 mn à pied du palais Güell et de la rembla. Merci à G pour ses bonnes adresses de restaurant ! Dear Customer, we thank you for your comments. We confirm that the maximum capacity and the surface area in m2 of the apartment are both indicated on the webpage. Everything was great and location of this apartment was also good. Owner was very friendly. Ruhige aber dennoch sehr zentrale Lage.Kontaktperson war sehr zuvorkommend & sehr liebenswert.Die Wohnung war sehr sauber & gepflegt.Lediglich in der Küche gab es eine defekte Bodenfliese im Spülbeckenbereich & seitlich am Spülschrank löste sich das Furnier.Sonst keinerlei Beanstandungen, wir haben uns sehr wohl gefühlt.